"Polish Wild West", but such term is a total mistake. 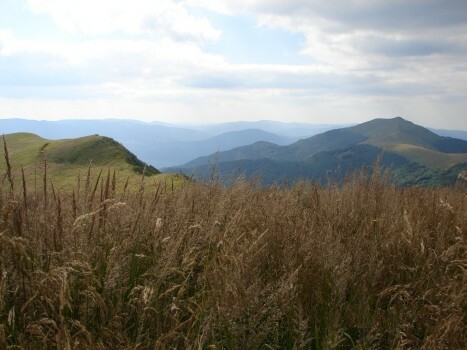 First, this is not west, but east of Poland, and second... Bieszczady associate with hard conditions, the lack of the infrastructure, extensive wilderness and this is the truth, but does it caused by mother nature protecting her treasures sternly ? - well, not. with the most necessary equipment, after this time the hause was fired.... and families have been taken away in four sides of world... Just because of this, defining Bieszczady as wild mountains is deplorable. As well as officious protection of the local nature. Being in the places of the former villages, the unique nature, turns to be the common bushes. 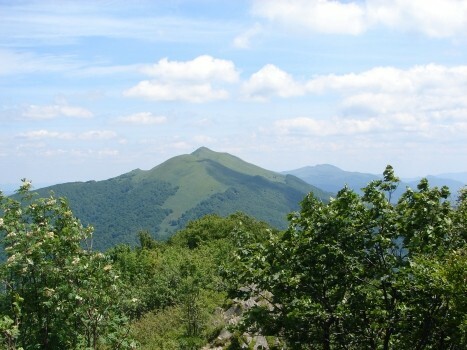 Just because of this, defining Bieszczady as wild mountains is deplorable. As well as officious protection of the local nature. Being in the places of the former villages, the unique nature, turns to be the common bushes. Of course, I encourage the protection of the nature, but f.ex. drive the bicycle forbiding ( where are suitable conditions) seems to be little exaggeration... 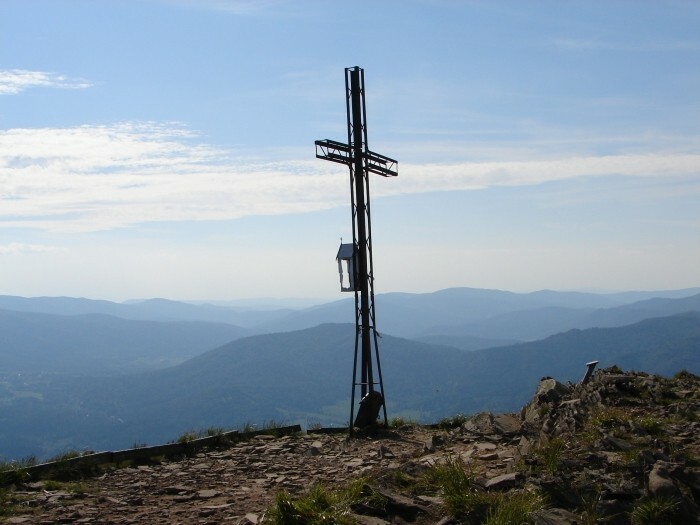 However Bieszczady are the great place for tourists valuing the "holy quiet". On popular routs, e.g. Wetlińska or Caryńska alpine tundra (in Poland called "połonina") in summer are lot of tourists, but if You'll hike a bit farther, e.g. 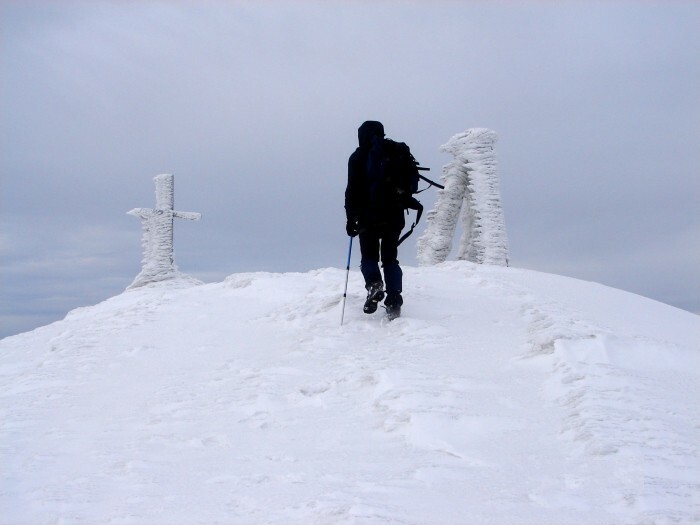 on Smerek - there are just single hikers. Be sure he is tourists a lot of in summer, but he will suffice to go, though and we have the holy quiet. The situation is completely differently in winter, when often You won't meet anyone on the route. 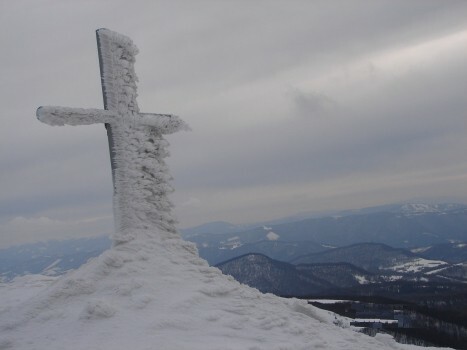 The reason is simple: only practised tourists go to Bieszczady in winter. “For a good choice of hotels with discount prices, visit: Hotels in Krakow for more information”. Krakow is placed about 250 km from Bieszczady, and is one of the most famous Polish cities with old history. The route starts in Berehy Górne, where You have to buy entry ticket to the Bieszczadzkiego National Park. Our route is marked red horizontal signs.We hike 1,30 hour up, mainly through the forest, to the small mountain hostel called "Chatka Puchatka (translation: Teddy bear Chalet)" - You can drink and eat here (own food as well). 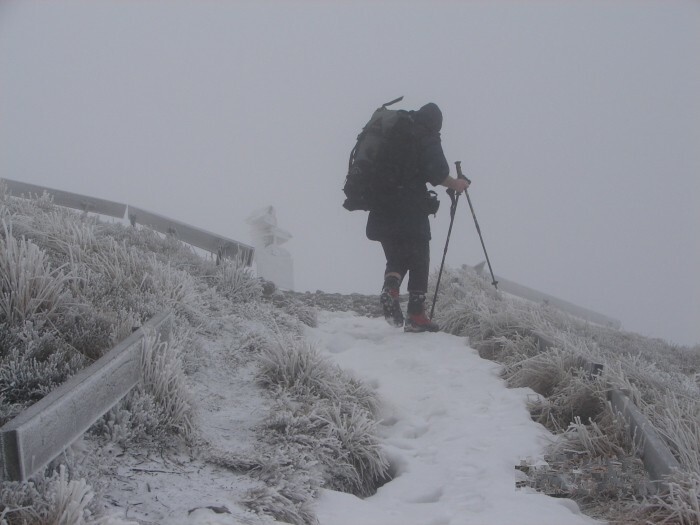 From this moment, we hike on the ridge (red signed route).From Chatka Puchatka to Orłowicza pass is approx. 1,30 hour. From the pass it is worth hiking on top of the Smerek - 20 minutes, and walk back on the pass. From Orłowicza pass we hike to Wetlina - yellow signed route - time from maps is 1 hour, but in practise it takes about 1,30 hour. We begin the route from the red signs marked pathway (along the natural path "Rozsypaniec" ), we hike approx. 2 hours to the Bukowska pass. This part of our route leads through the forest and softly climbs up. 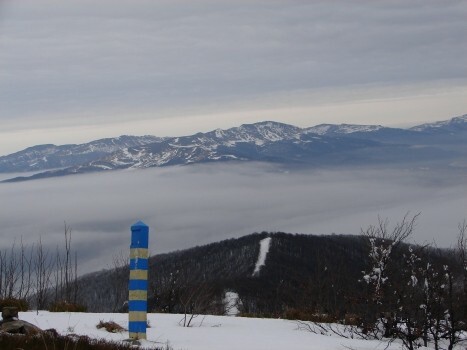 From Bukowska Pass, having the favourable transparency of the air, it is possible to see the highest top of whole Bieszczady chain - Pikuj - 1408 meters (being placed in Ukraine). From the pass we still following red marked route to Halicz - about 1 hour. From Halicz to Siodło pass is approx. 1,15 hour. Climbing on Tarnica is easy and takes about 20 minutes from Siodło Pass (yellow marked route ). We hike back blue marked route from the Siodło Pass approx. 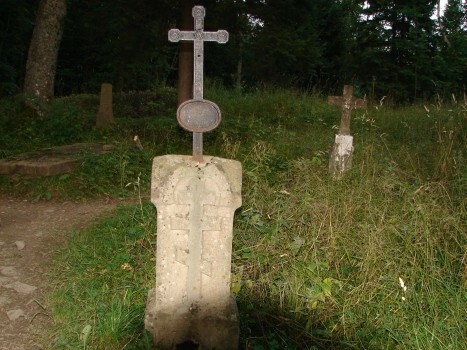 1,15 hour to Wołosate village. there are a lot of railway connections (to Zagórz, Sanok, Przemyśl ) and buses - e.g. the connection from Cracow to Ustrzyki Górne. from these cities are some buses to Ustrzyki Dolne, where we have to change bus following to Ustrzyki Górne ). The hostel base is generally quite good. 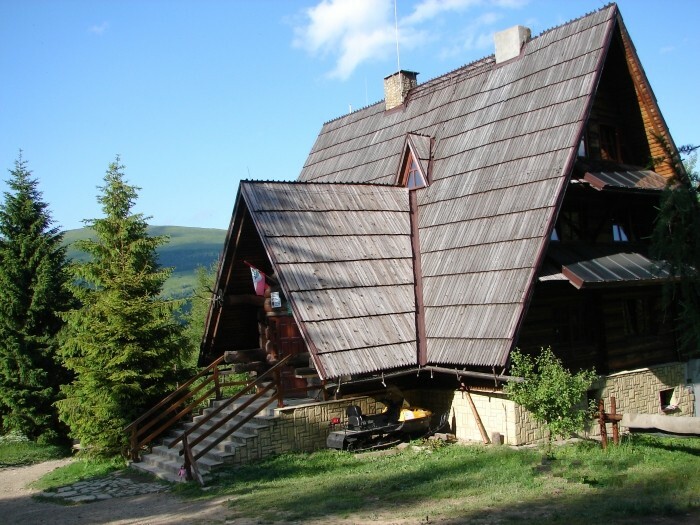 In villages: Wetlina and Ustrzyki Górne there are private guest-houses, some hostels and camping fields. 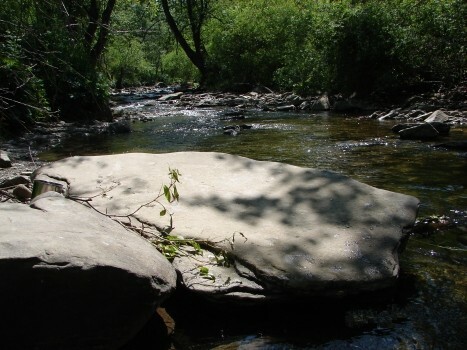 I used to stay on the camping field in Berehy Górne, but You have to know that there are'nt any facilities: bath in the stream, and you should go approx. (połonina) - Połonina Caryńska and Wielka i Mała Rawka.